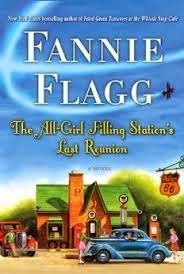 a book chick: "The All-Girl Filling Station's Last Reunion"
"The All-Girl Filling Station's Last Reunion"
my take: I always love a Fannie Flagg book...generally small-town Southern, salt of the earth people, slightly funny, slightly touching. You're gonna feel good when you get done reading Fannie and sometimes that's what's needed. Although one might call this a "light read," there's plenty of World War II history and bit of mystery to uncover. The story is told from 2005 perspective of empty-nester Sookie in Alabama and 1940's perspective of wild girl Fritzi in farmland Wisconsin. Ms. Flagg weaves a great tale to bring these two women together. I read this between some heavier reads while vacationing and it WAS just what fit the bill that day, which happened to be a beach day ... I think this might fit the bill if you need a little something to get through a winter day as well. see also: I Still Dream About You, Daisy Fay and the Miracle Man, Fried Green Tomatoes at the Whistle Stop Cafe I think are her best - she says Daisy is her attempt to portray her own difficult childhood - I thought it was very funny.